There are regular restaurants, and there are those that has turned into institutions. I have no clear view how and why they have gained this status, but it has something to do with history and tradition. Els Quatre Gats has achieved this status as it encapsules the rich artistic traditions in Barcelona. Salvador Dalí and Pablo Picasso went here and paid (i.e. before they became famous), as many other less famous artists, their dinner with paintings. Els Quatre Gats captures, in my mind the very essence of Gaudís Barcelona. And the food and service is excellent too. Els Quatres Gats is located in Carrer Montsió 3B, a narrow street in the Barri Gothic, close to the Portal Angel and the Cathedral Square. It is easy to find and within walking distance from Placa Catalunya. 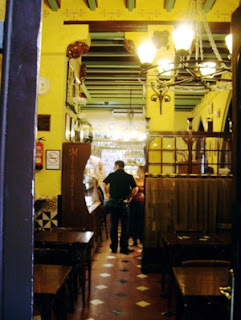 Eating at Els Quatre Gats is a feast, and the interior is an important part of the experience. As you are led through the bar you enter a large bright yellow room, with a roof covered with white tiles. Stairs lead up to a narrow gallery where you can get the most romantic tables for two overlooking the restaurant. Chairs made from dark wood and white tables creates a classic style. The walls are covered with pictures with many different motives, and quite a number of them are memories from when a celebrity visited the restaurant. A wonderful contribution to a great evening is the live music. A man by the piano and an old violinist played classic café style music, and everyone seemed to enjoy it. We paid around €111 for two entrees, two main courses, and two desserts and a bottle of excellent white wine. It was worth every euro. Brilliant service from a polite and professional staff. Our English speaking waiter was of great help and a white wine that was perfect to our food. We did not wait long to be served and all that was served was steaming hot. The food was as close to perfection as possibly could come. I chose duck mi-cuit with apple and Cumberland sauce, and Terje ordered a "Escalivada" baked bell pepper and aubergines. The slices of semi cooked duck liver was delicious, and the sweet apple and the homemade cumberland sauce with plenty of orange zest provided the necessary acidity to cut the richness of the livers. We chose the same main course - salt cod with Catalan spinach and honey aioli. The combination of the ingredients used was highly unusual. The salted cod, perfectly prepared was placed on top of the spinach. On top you had a slice of apple topped with honey aioli. The saltiness of the fish was perfectly balanced by the mild sweetness from the apple and the honey aioli. The sauce on the plate was a mild tomato sauce garnished by preserved sweet fruits. This dish was most extraordinary culinary experience, I have had for years. The dry white wine was perfect to this dish. If you like fish, order this dish - you will be amazed!! Terje ordered the Crema Catalana and I chose a fresh fruit mousse. It was a perfect end of a great evening. As the Muslims say, only Allah is perfect - but this is very close to perfection. Looking for a better place to eat tonight? See other restaurants visited in Oslo and around the world here on Enjoy Food & Travel!